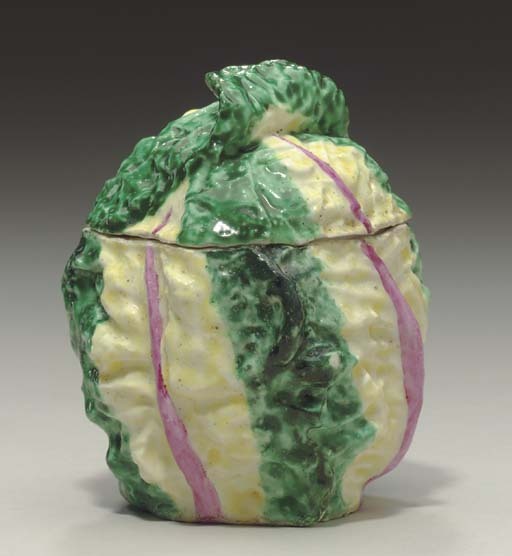 Please note that the title should read A DERBY CABBAGE-TUREEN AND COVER, CIRCA 1753, the estimate is $4,000-6,000. For the only other recorded example see The Property of Lady Hilda Charteris Wemyss, sold Christie's London, 15 February 1988, lot 202. For a white example of this rare model see Dennis G. Rice, Derby Porcelain, pl. 38, exhibited by Winifred Williams Ltd., Exhibition Catalogue, Early Derby Porcelain (1973), no. 9.